The United States Trade Representative (USTR) advised that they have begun the process of assessing additional duties on certain goods from the European Union (EU) and certain EU member states. In 2004, the U.S. filed a complaint with the World Trade Organization (WTO) Dispute Settlement Body (DSB), citing the EU was unfairly subsidising the EU’s large civil aircraft domestic industry inconsistent with the Agreement on Subsidies and Countervailing Measures (SCM). The WTO report dated May of 2011, confirmed that the EU and certain member states subsidies breached the SCM agreement. The DSB recommended that the EU bring the inconsistencies into line with WTO rules. The EU responded in December 2011, that the WTO recommendations had been implemented. The U.S. did not agree that the changes had been made and requested authorization from the DSB to impose countermeasures against the EU. The EU then referred the matter to arbitration to assess the proper level of countermeasures. In 2012, the U.S and the EU entered into a procedural agreement to which arbitration would be suspended until the WTO and appellate proceedings determined whether the EU had implemented the DSB recommendations. In May of 2018 the DSB confirmed that the launch aid to the Airbus A380 and A350 XWB aircraft continued to be inconsistent with WTO rules and were adverse to the U.S. airline industry. A report by the WTO arbitration determining the level of countermeasures to be authorised is expected by summer 2019. The U.S. Trade Representative has initiated an investigation of the subsidies to Large Civil Aircraft by the EU under the authority of section 301 to determine if the conduct exhibited by the EU is actionable. The USTR remains open to talks with the EU to come to an amicable resolution. The USTR, upon direction of the President, proposes to take action on the products listed in Section 1 of the Annex. These would include the imposition of additional duties of up to 100% on products manufactured in Germany, France, the United Kingdom and Spain. Section 1, includes new civil helicopters and aircraft (both passenger and cargo), and parts thereof. The USTR is also proposing action on Section 2 list of products manufactured in any of the 28 member states which includes the following countries: Austria, Belgium, Bulgaria, Croatia, Republic of Cyprus, Czech Republic, Denmark, Estonia, Finland, France, Germany, Greece, Hungary, Ireland, Italy, Latvia, Lithuania, Luxembourg, Malta, the Netherlands, Poland, Portugal, Romania, Slovakia, Slovenia, Spain, Sweden and the UK. Section 2, is substantially larger and includes seafood, dairy, olives and olive oil, fresh or dried citrus fruit, jellies, jams, pastes and purees, juices, wine, liquerers, cordials, essential oils, handbags, carpets and tapestries, certain clothing, blankets, kitchenware, backhoes, motorcycles and their parts, and bicycle parts. A link to the complete list of both Sections 1 and 2 can be found starting on page 10 of the documents here. Please note that this is a preliminary list that may change prior to implementation. How Will This Affect My Imports? If you ship or import any products that are on the list and are manufactured in one of the countries associated with that list, the duties paid on imports to the U.S. may increase. This will affect your profit on the sale of the merchandise. 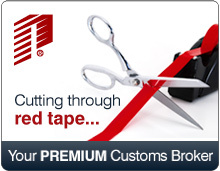 When your import duties increase you may be required to obtain a larger customs import bond. May 15, 2019: The Section 301 Committee will convene a public hearing in the Main Hearing Room of the U.S. International Trade Commission, 500 E Street SW Washington DC 20436 beginning at 9:30 am. You should submit written comments through the Federal eRulemaking Portal: http://www.regulations.gov. Follow the instructions for submitting comments in sections E and F below. The docket number is USTR-2019-0003. For issues with on-line submissions, please contact the Office of the United States Trade Representative (USTR) Section 301 line at (202) 395-5725. For questions about this investigation or proposed determinations, contact Megan Grimball, Assistant General Counsel, at (202) 395-5725. For questions on customs classification of products identified in the Annex to this Notice, contact Traderemedy@cbp.dhs.govquestions on customs classification of products identified in the Annex to this Notice, contact Traderemedy@cbp.dhs.gov.